I am standing for re-election as your chairman. I have spent 19 active years in U3A, both locally (chairman, treasurer, group leader, event organiser, secretary and chairman of Thames Valley Network) and nationally (regional trustee, sub-committee chair, NEC vice chairman, chairman) and these years have provided me with the breadth of knowledge and experience to continue to lead this unique movement forward to new achievements at a time of change. My personal background has taken me all over the UK, living in nine out of the 12 regions. I studied Modern Languages at university, including a term at Humboldt University, in the then East Berlin. I have worked for the Inland Revenue, The Office of Population, Censuses and Surveys, and as a Commercial Insurance Broker . In the voluntary field I have been a Samaritan and worked for the Citizens’ Advice Bureau. Currently, I am an invigilator for the British Computer Society. I have a fantastic family: my husband, three children, several grandchildren ranging in age from 12 to 26, plus our dog Martha. Locally – in the 19 years of being a member of my own U3A – Witney – co-ordinator of a variety of interest groups as well as holding office as treasurer, then as chairman, and having organised 16 study tours and many outings. Network experience – Thames Valley Network as secretary, then chairman. Nationally – South East regional trustee for three years, representing 180 U3As where I was involved in setting up more than 20 new U3As. Vice chairman of the Trust in 2014, chairman in 2015. I attend all finance and governance sub-committee meetings of the NEC and also attend many sub-committee meetings. 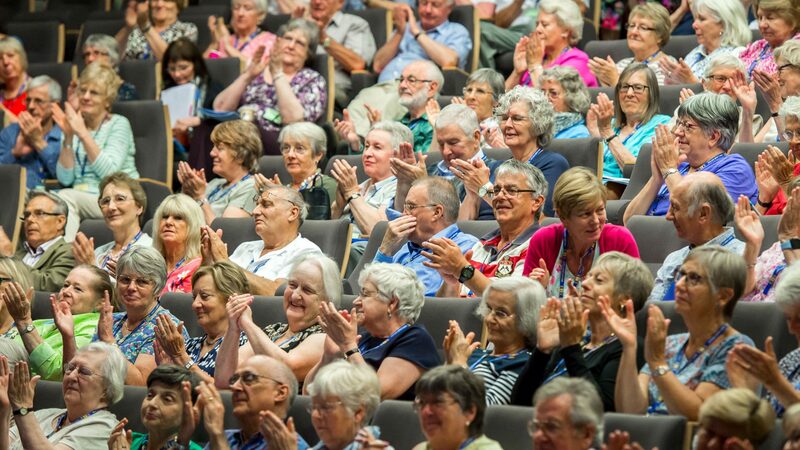 In January 2015 I consulted with former chairmen and trustees as well as newer U3A members to elicit their views on the future of the organisation. That consultation is ongoing. I have been delighted to attend celebrations and conferences of U3As in many parts of the country. I have been privileged to chair the Royal Institution and Francis Crick lectures and have attended the DANA lectures. My interests include reading, theatre, classical music, my garden, cookery, walking with Martha (our dog), the sea, the countryside, watercolour painting and, recently, the game of bridge. The breadth of my experience means that I have developed a wide range of skills. Most importantly the ability to listen, to work with and to understand people, while managing a diverse and demanding workload. I am fortunate in having a great deal of energy which has assisted me in dealing with a many situations and problems. There have been challenges, including several changes to the organisation. I believe that a good chairman delegates to the experts whilst overseeing and contributing, where appropriate, to all that is undertaken. It is my responsibility to be aware of what is happening by attending meetings and workshops. I use my energy and motivation to inspire others. I take immense pride in our movement and what it has achieved, and I wish it to continue to even greater heights in the future whilst still retaining our unique ethos. I have operated at all levels in the organisation, which means that I fully appreciate key perspectives and am always prepared to listen and react to members’ thoughts and ideas. It was because I had listened that I set up the consultation on the future structure of the U3A movement, where everyone who wished to participate has had the opportunity to do so. A small working group has travelled around the country and set up meetings wherever requested. 23 such meetings were held and the results have been published to all U3As. There will be a further opportunity for discussion at the AGM, and an EGM will be held in the spring when any resolutions, including changes and amendments to our Memorandum and Articles of Association, will be tabled. This is the first time in recent years that members have had the opportunity to state their views in this way. The job of the NEC is to endorse and support the principles upon which U3As are built: self-governance, co-operation and the values of lifelong learning through our interest groups. We are unique, and we must remain unique! Assist those who lead groups. Set up new U3As and offer them ongoing support. Assist U3As in need of support. Continue the programme of U3A-related participative workshops. Use technology to enhance our learning methods. Provide induction and ongoing support for existing U3As. Encourage members to carry out research. Include those members who have problems with hearing loss and other disabilities. To this end we have set up U3A+, which will provide support and advice for these members, based on the experience of U3As and their members. Improve the governance of the Trust by streamlining procedures and documentation. Provide facilities for members who wish to study a range of subjects in greater depth. Remember the frail and the disabled, as well as those who find technology daunting. Include everyone who wishes to join – no waiting lists! Publicise the movement locally and nationally, by advertising what we do to those who still have not heard of us. We now have a communications officer who will do that using all means available, including social media. Nationally, U3As need to know what the Trust is offering, and the Trust needs to know what members want from it. Our very best means of communication is through Third Age Matters as it goes directly to members, but this should be a two-way process. Communication is key to making the very best of our shared experiences. I would hope that all members will take the magazine and will contribute their views on both Third Age Matters and Sources, our educational bulletin. The NEC is the elected body which manages the Third Age Trust in its supportive role for U3As. It works as a team to carry out its duties as specified by the Charity Commission, as well as fulfilling the objectives of the Trust and, as a national charity, strives to be efficient and to ensure that all projects and activities are cost-effective. NEC sub-committee chairmen will continue to invite members with relevant skills in education, communications, technology and research to join them. We must tap into our members’ vast fund of knowledge. We will continue to support the ‘Beacon’ management support system. More and more U3As are migrating their data to this very successful system. National trustees: are elected from volunteers. We need to streamline the national trustee role in order to make it manageable, and fit into the busy life of the modern ‘retired’ person. We need volunteers to take on some of the regional duties to free national trustees so that they may devote themselves to the governance of the movement. Networks will be supported as they become increasingly important. The consultation has revealed the importance, relevance and value of smaller groupings of U3As such as networks and neighbourhood groups. Communication is key: With 1,010 U3As and almost 390,000 members we must meet the challenges of the future. All avenues of communication will be broadened. I would continue to represent the organisation externally. My experience of U3A, my track record in effecting change and improvements, and my energy, zeal and passion for the organisation will all assist me in guiding U3A to new achievements. I will continue to be a very present, active and committed chairman. Last August we welcomed Sam Mauger as our new CEO. Formerly CEO of Age UK London, Sam came from a charity background and her broad knowledge of the sector, together with her ability to absorb very quickly the ethos of our movement, has provided an impetus which is driving us forward. She and I work closely together and, with other changes to the staffing, that continuing co-operation is vital. To advise and support 1,010 U3As we still have only the equivalent of 8 full time staff. We are developing a strategy of encouraging more and more volunteers to become involved in a range of activities. In doing this we are fulfilling what our founders intended: i.e. that everything is done by third agers for third agers. Continuity is vital for the organisation when major changes are taking place. For the continued success of the movement I believe I have a vital role at this time and therefore ask that you re-elect me as your Chairman.